With the Kaala teaser's release, Twitter is celebrating the return of Rajinikanth. "Thalaivar is back!" cheers Twitter, who is already floored by the teaser of the megastar's upcoming movie. Rajinikanth portrays gangster Kaala Karikaalan in the Pa Ranjith directed movie - his second collaboration with the director after the 2016 blockbuster Kabali, which also saw him play a gangster lord. "Beautiful teaser! More than calling it as totally fiery, Pa Ranjith portrayed #Kaala's life in a minute. Lovely storytelling," read a tweet while another added: "When everybody is enjoying the festival of colours... some of us are enjoying the festival of black." "This Holi, black is going to be your favourite colour. Mind it," said another tweet. Twitter has also found some traces of Rajinikanth's looks from Kabali and his 1995 film Baasha in his brand new Kaala avatar. See Twitter's reaction here. 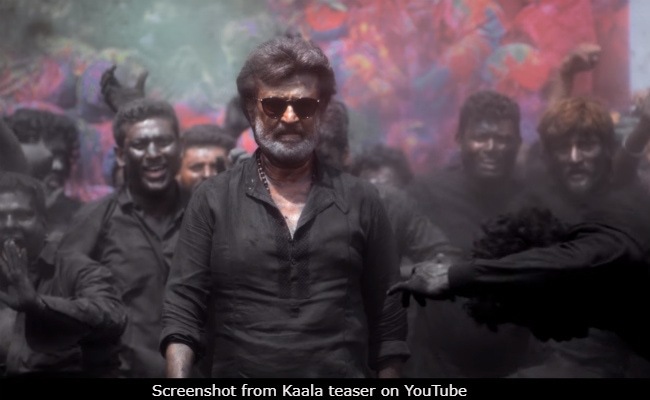 The makers of Rajinikanth's film released the teaser late night on Thursday - hours before its scheduled time - reportedly to avoid the video being leaked. Soon after its release, the teaser quickly went viral - it remained the top trend on Twitter all of Friday morning and continues to rule YouTube's trending chart of videos with as many as 5 million views in a little over half a day. In Kaala, Rajinikanth co-stars with Nana Patekar, Huma Qureshi and Samuthirakani and plays the titular slum-lord-turned-gangster in the movie, which is being produced by Dhanush, the veteran actor's son-in-law. Witness the wrath of Kaala aka Rajinikanth in theatres on April 27.